A subsidiary of Bacardi, John Dewar and Sons is a Scottish distiller and whisky blender. The company has five distilleries: Aberfeldy, Aultmore, Craigellachie, MacDuff and Royal Brackla. John Dewar and Sons is headquartered at London Road, Glasgow which is also where the company’s ageing warehouses and blending facilities are sited. 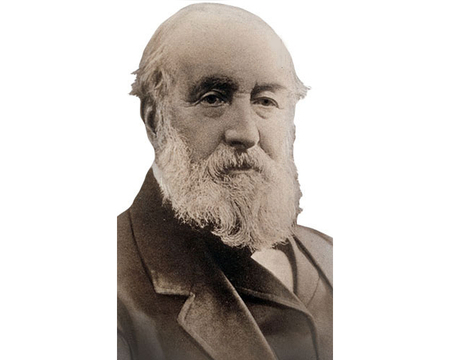 The Dewar’s story begins in 1805 with the birth of its founder, John Dewar, who became the biggest success story to emerge from a hamlet in rural Perthshire rather improbably called Dull. From humble crofters beginnings as the seventh of nine children, his break came aged 23 when he was employed in a wine merchants owned by his step-mother’s relation, Alex MacDonald. Nine years later he was made a partner in the firm, which was renamed MacDonald & Dewar. In 1846, his partnership in MacDonald & Dewar was dissolved, allowing the now 41-year-old to establish his own eponymous spirits and wine merchant. The catalyst for change was Jane Gow, whom he married in 1845 – she fell pregnant shortly after. Cognac and Irish whiskies were the fashionable tipple of the day, but John’s aim was to get the Scottish drinking Scotch. The exact date that he started blending whiskies is unknown, but it’s clear he quickly became adept at the art. 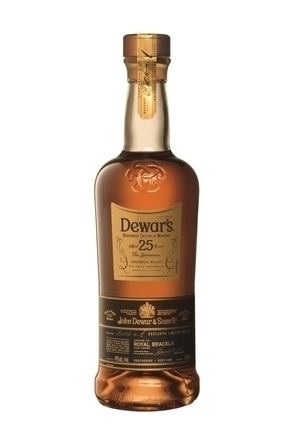 John’s company, Dewar’s, didn’t own its own distillery, it simply used stocks purchased from other to make its blends. 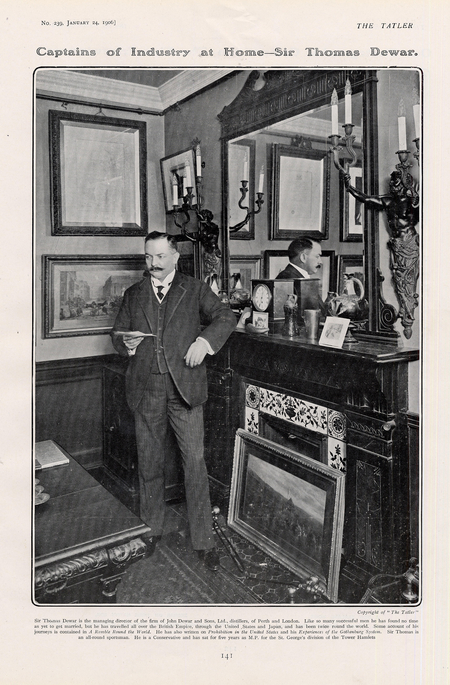 In 1879, John’s second eldest son, John Alexander Dewar, joined the firm. His father died the very next year leaving behind ten children and an estate valued at £34,796, some £2 million in today’s money. So, it fell to John Alexander and his younger brother Tommy to maintain the family’s business. Not only did they ensure it survived, they succeeded in building a global brand. Of the two brothers their father’s death left running the firm, John Alexander was the sensible one. He went on to build Aberfeldy Distillery, which would come to be the heart of the Dewar’s blend, maintained his father’s business with meticulous care and took over responsibility for blending. But it was Tommy, only 16 when his father died, who’s brilliant marketing captured the public’s imagination, so driving sales of their whisky. He was a maverick, a traveller, a raconteur and all-round bon viveur. Aged just 21, Tommy travelled to London with the intention of developing business. Upon arrival, he discovered that one of his two contacts had died – “I thought then to evade me,” he would write years later – and then that the second had gone bankrupt. Rather than bashfully take the train home, Tommy stayed and for two years worked on building contacts, relationships and spreading the word about Dewar’s blends. He would go into pubs that he’d targeted because they didn’t currently sell Dewar’s whisky and ask for it. Then two days later he would send a salesman in to push the landlord into ordering. Being sent Scotch whisky resulted in bad press for President Harrison, who was criticised for drinking Scotch rather than American-made bourbon, but it proved a major publicity coup for Dewar’s and orders started flooding in from America. Spurred on by this boost in trade, Tommy quit London, instead opting for the life of a travelling salesman. 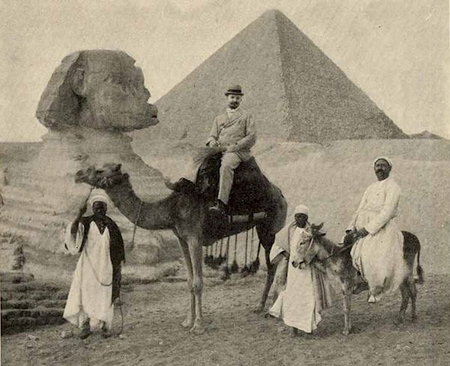 Departing on his first world trip in 1892, Tommy visited 26 countries in just two years, famously stating that “many a false step is taken by standing still”. While travelling he appointed a 32-strong global sales force, the sales from which drove the company’s value to £625,000 – the equivalent of some £48 million today. 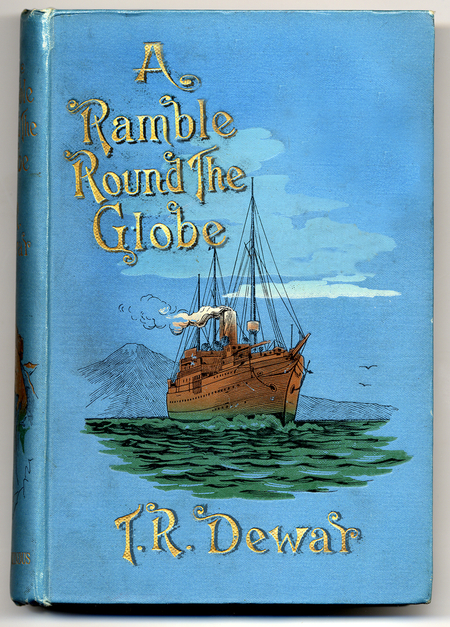 Upon returning he published a book A Ramble Round the Globe, to critical acclaim. Meanwhile, his brother John secured a Royal Warrant in 1893 from Queen Victoria, the first blended whisky to do so. John Dewar & Sons has enjoyed royal patronage ever since – only interrupted when the crown passed to Edward VIII, who was on the throne for such a brief time that he didn’t renew or award any warrants. Dewar’s is the only whisky brand able to claim patronage from every monarch since Victoria. Things continued to go well for the brothers, who won plaudits and titles in recognition of their success. 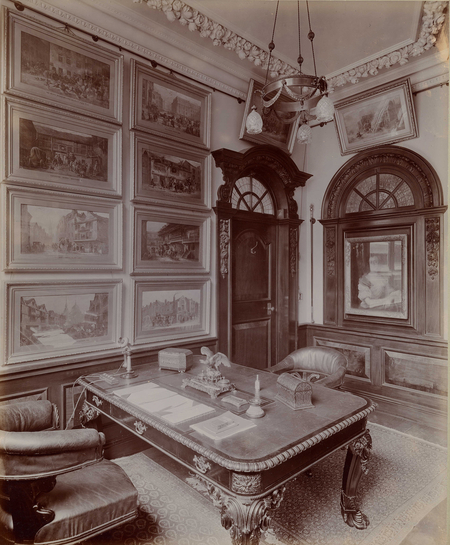 John was made Treasurer of the city of Perth by 1885 and Lord Provost in 1893, while Tommy, who had recently purchased the third ever motor car in Britain, became High Sheriff of London in 1897. It was around this time that John decided to build Aberfeldy Distillery near to where their father had been born in Perthshire. Prior to this, the company, which also boasted a master blender, Alexander Cameron, and included a P. M. Dewar (no relation) on staff, had been largely reliant on Tulliemet Distillery [also known as Achnaguie Distillery this closed in 1912]. It had a small production line, capable of churning out 24,000 gallons annually, which very quickly became inadequate. But being able to call itself both a blender and a distiller was an important mark of standing and in 1898 John Dewar & Sons was a stronger company with the completion of its Aberfeldy Distillery. On the completion of Aberfeldy in 1989, Tommy took off on a second world tour, embarking on the first of what would be many incredibly successful advertising campaigns. 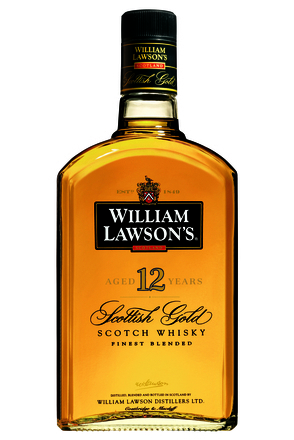 The slogan he introduced, ‘Whisky of his Forefathers’, served the company right up until 1970. However, 1898 marked a terrible year for the Scotch whisky industry. Pattisons of Leith crashed, taking with it nine companies and several smaller suppliers, not to mention Scotch whisky’s good name. This was compounded by the Boer War which followed a year later, eliminating Dewar’s loyal South African market for a time. These crises did not dent the Dewer’s brothers ambitions and in 1899 they launched White Label, a product that quickly became its best-selling whisky. The turn of the century saw Dewar’s fortunes continue to rise with sales reaching one million gallons and new offices in Sydney, Melbourne, Calcutta and Johannesburg following the end of the Boer War in 1902. 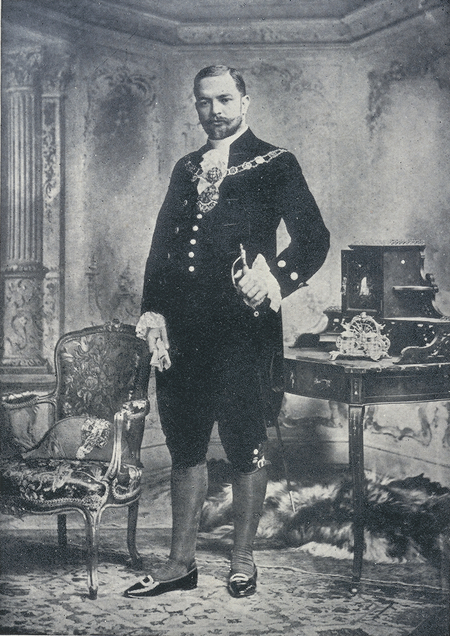 King Edward VII knighted Tommy, the same honour he had bestowed to his older brother John five years earlier. The budget spent on advertising reached nearly a fifth of the company’s total profits – though this reflected a wider industry trend. Before Pattisons folded it had been the trailblazer for Scotch whisky advertising, in one stunt giving out 500 African Grey parrots to licensed grocers, all of which were purported to chant “buy Pattisons’ Whisky”. Tommy came up with similar hare-brained schemes, some utterly brilliant and others at best showing his artistic flair. One such idea being a bicycle tyre tread that spelled out ‘Dewar’s Whisky’ in the tracks it left. He relentlessly branded anything and everything from ashtrays, mirrors, silver toothpicks and letter openers to calendars, counter bells and bowls. One of his unusual tricks was to throw messages in bottles overboard while travelling, inviting whoever found them to contact Dewar’s for a whisky reward. “Keep advertising and advertising will keep you,” is one of Tommy’s most quoted phrases. It was clear by 1908 that overproduction was stifling the whisky industry and then in April 1909 Lloyd George’s budget raised tax on spirits by a third. It only took one year for the full effects to be felt: spirit consumption plummeted, falling by one-third across the UK. Thankfully, John Dewar & Sons was cushioned by its export market, buoyed by its receiving two new warrants from the Swedish and German royal households. Just before things boiled over completely in Europe, Dewar’s, and in particular Tommy Dewar, was up to his old advertising tricks. Using an old tower near London’s Waterloo Bridge - in 1911, Tommy commissioned an advertisement made of 1,400 light bulbs and six miles of electric cable to create the image of a Scotsman, complete with a bottle of whisky and glass, pouring himself a drink and toasting passers-by as his kilt swayed in the breeze. War broke out in 1914 and the whisky industry was on rations as grain was needed for food. Only months before, Dewar’s had provisionally signed papers with James Buchanan & Co for a ‘correlation of interests’ and their merger was announced in March 1915. The new company, at first called Scotch Whisky Brands Ltd and then renamed Buchanan-Dewar Ltd, was forced to stop distilling due to the war in early 1917. Disaster struck again almost as soon as Dewar’s restarted distilling after the war in March 1919 when America went dry, passing the National Prohibition Act. 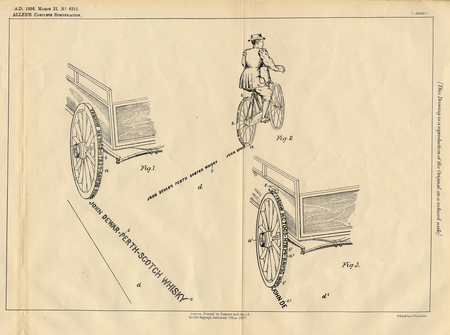 While sales to countries surrounding the USA multiplied (accounted for by smuggling into the U.S.), the loss couldn’t atone for the loss of revenue and customers brought about by Prohibition. Things were to become even worse for Scotch whisky. Taxes were raised in Britain but were forbidden to be passed on to customers, crippling profits. Then the Great Depression hit at the end of the 1920s. In 1925, there were 124 distilleries operating in Scotland, but by 1929 that number had reduced to just 84. The hard times encouraged a period of industrial consolidation, and many companies entered negotiations to merge: Buchanan-Dewar acquired Ord, Pulteney and Parkmore when it took over James Watson & Co, and subsequently bought Aultmore Distillery as well. A very much larger merger followed early in 1925, with the aims of cutting costs and stabilising the industry, Buchanan-Dewar joined with John Walker and Sons to become part of the Distillers Company Ltd (DCL). 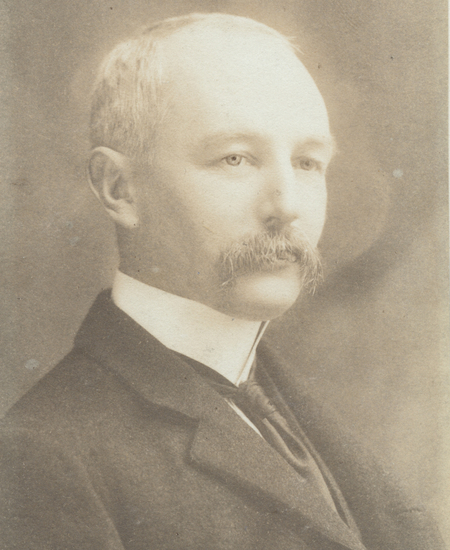 Although part of a larger company, Dewar’s maintained control over its direction. It was still technically competing against Walker’s and Buchanan’s for sales but at the same time had to co-operate with them. 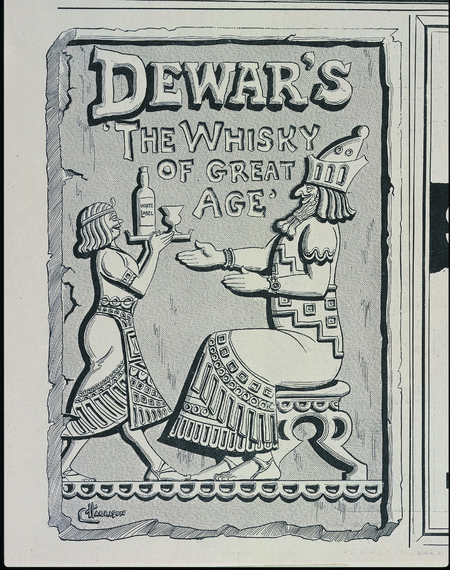 Even if this was a time of large-scale changes within Dewar’s it was also a time of abundant opportunities, particularly in their global markets. In 1927, a feat of modern technology enabled Bert Hinkler to fly from London to Sydney in just 16 days, taking with him a bottle of Dewar’s whisky and so generating more welcome publicity. The impressive flight captured the attention of the press on both sides of the globe. But just as things hadn’t been going exactly smoothly in the UK, Australia was struggling with its own problems, including inordinately high taxes on imported whisky. 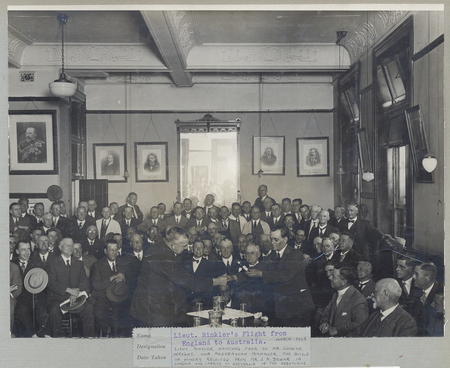 This, coupled with the artificial strength of the pound, thanks to the 1925 re-introduction of the gold standard, knocked the profitability of Dewar’s Australian business. The way round this was to build a distillery near Geelong in Victoria, which started producing whisky in 1928. As Bert was taking off for Sydney, the Pathé newsreel company happened to be filming at Dewar’s Aberfeldy distillery. In another ground-breaking marketing move, it produced what was then a rare glimpse into the working life of a distillery in the late 1920s, including the sheer amount of manpower required to make whisky. 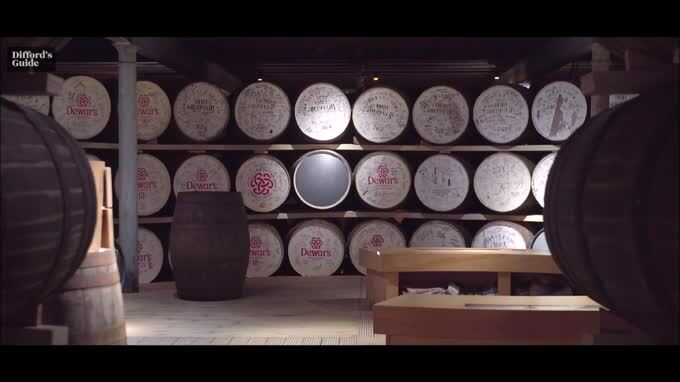 This is believed to be the oldest surviving footage of Scotch whisky production and you can now watch this at Dewar’s World of Whisky at the Aberfeldy Distillery. Unfortunately, the Dewar’s famous brothers died within months and John and Tommy would never see the eventual recovery of their beloved spirit. John passed away in November of 1929. Lord Forteviot, to give him his full title, was 74-years-old and had been chairman for 35 years. His charity, The Forteviot Charitable Trust, still operates today, providing poverty relief and education throughout Perth, Dupplin and Aberdalgie. 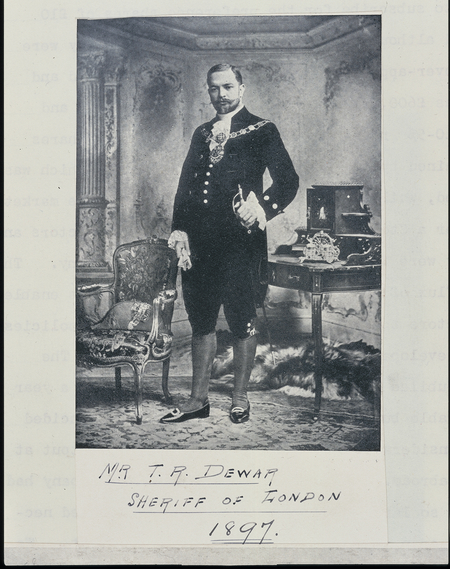 Tommy, or Lord Dewar of Homestall, took over from John as Chairman but only for a brief three months as he died in early 1930. 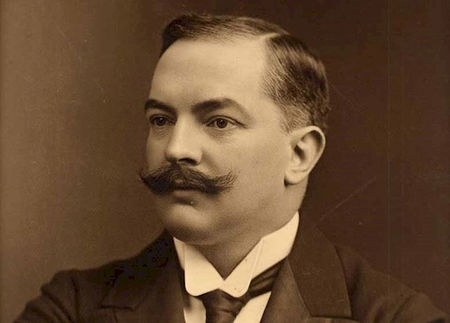 They left behind a completely unrecognisable company to the one they’d inherited and thanks to Tommy’s wit, marketing skills and sheer boldness, as well as John’s care, fastidiousness and attention to detail, Dewar’s had made it safely through the bleak years. Both died fabulously rich men. 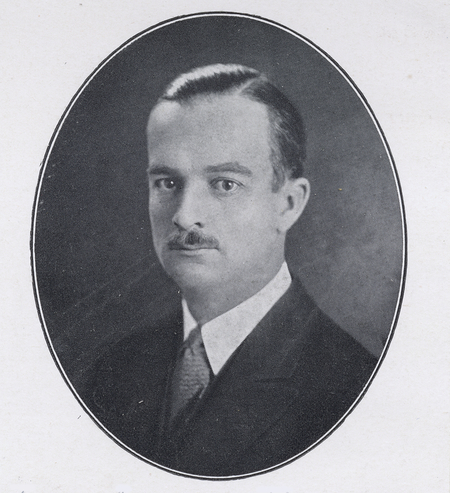 After the sad loss of the brothers, P. M. Dewar was appointed chairman and John and Tommy’s nephew, John Arthur Dewar, became director in 1922. It was then that the merger of DCL eventually brought some stability to the market. In the early 1930s things started to look a little brighter: tax cuts were made, Prohibition was abolished in America and around the globe countries slowly started to emerge from the depression. In true Dewar’s style, the end of Prohibition proved dramatic. While talks were going on and it became clear that repeal was close, Dewar’s U.S. agent Joseph P Kennedy (from the iconic Kennedy clan) had a large shipment of Dewar’s whisky sat waiting onboard a ship off the coast of New York. Just hours after Prohibition officially ended, the ship docked. 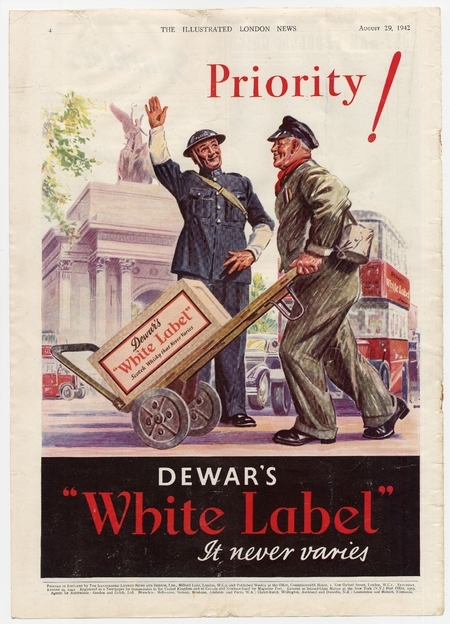 The company’s advertising then brought the Dewar’s brand into the realms of colour printing, first appearing in Britain’s Daily Record in 1936. 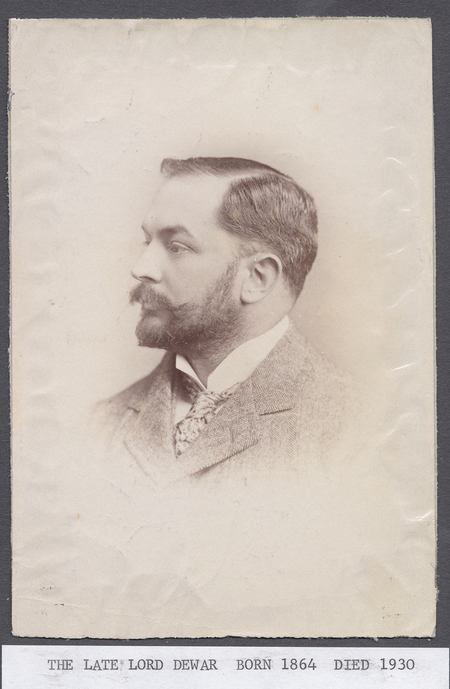 A year later John Alexander’s son, John Dewar, became chairman of DCL, showing not only that the family remained involved in Dewar’s interests but they were taking care of the group. Just as things were improving for Dewar’s, World War Two broke out. Anticipating hostilities, the company evacuated its London staff to Perth and dug trenches around the premises. Right up until September 1939, when war was declared, sales soared as people panic-bought whisky in anticipation of rationing. As predicted, both production and sales were rationed and eventually stopped. After the war, distilling was slowly allowed to resume. 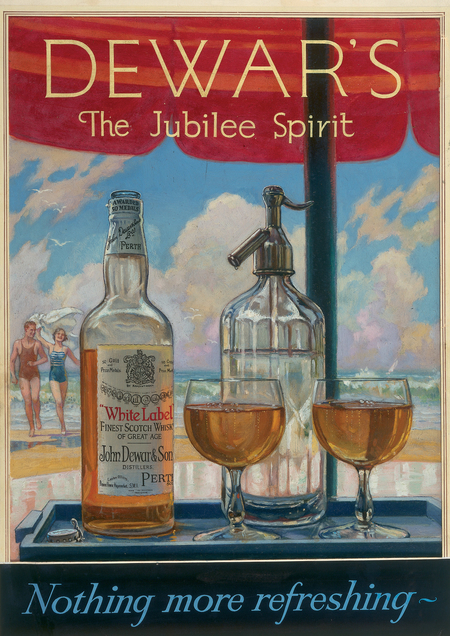 Despite the wartime restrictions, Dewar’s had never stopped advertising, in both the UK and its export markets, to protect itself as best it could. 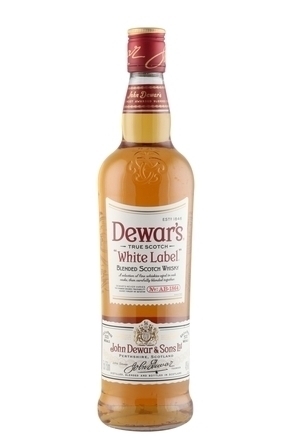 Before the war, Dewar’s White Label blend had been the focus it terms of profit and volume and this continued after the war, turning into boom years during the 1950s. The Dewar Highlander became the official company symbol in 1953, appearing on all advertisements worldwide. Across the Atlantic sales continued to rise but it was 14 years after the war ended before Dewar’s was finally able to sell unrestricted by quotas in the UK. Continuing good fortune prompted the decision to move company headquarters, from old Victorian buildings sitting on a four-acre plot to a new 26-acre site with state-of-the-art machinery including a new bottling line and a further 24 acres for future development. When the new site opened in 1962 Dewar’s had a 6.8% share of the global Scotch whisky market, selling over 2.5 million proof gallons and America had overtaken the UK as the primary market. The second son of John Alexander Dewar, Henry Evelyn, the third Lord Forteviot, was chairman of the company at the time. 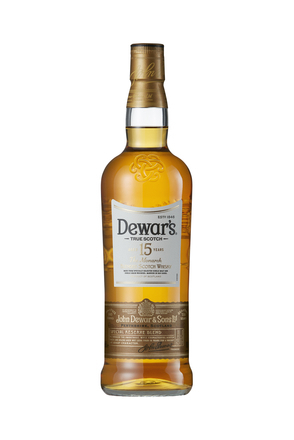 By 1975, Dewar’s accounted for 10% of Scotch whisky sales in the USA. When Henry Evelyn retired in 1976, he became the last Dewar to hold the position of chairman, although his son John remained on the board. Even without a member of the Dewar family at the helm, things went from strength to strength, the brand overtaking J&B Rare as the best-selling Scotch in America, reaching nearly 4 million gallons in 1980. Dewar’s also continued to do well in countries as varied as Spain, Lebanon and Venezuela. A further period of industrial consolidation awaited. In 1985, what had started as hesitant merger talks concluded in the £2.3 billion purchase of DCL by Guinness, which already owned Arthur Bell & Co, emerging in 1986 as United Distillers Group. Ten years after that merger marked the 150th anniversary of John Dewar setting up his original shop and blending whisky. An extravagant celebration ensued with historical exhibitions and a website commemorating Tommy Dewar’s remarkable exploits, treasures and artefacts. Dewar’s was dramatically affected by the 1997 merger of the United Distillers Group with its rival, Grand Metropolitan to form what we know today as Diageo. The newly formed conglomerate was deemed to hold too great a monopoly on both the UK and USA whisky industries so was forced to sell off certain brands, including Dewar’s. Consequently, in 1998 John Dewar and Sons became part of Bacardi Ltd.
Bacardi’s purchase of Dewar’s came as part of a package with four distilleries: Aberfeldy, Aultmore, Craigellachie and Royal Brackla. These, along with MacDuff which Bacardi already owned, form the five distilleries under the present John Dewar and Sons umbrella. In an astute move signalling its recognition of the legacy and history of their newly acquired asset, Barcardi turned Aberfeldy’s disused malting hall into a flagship visitors centre, Dewar’s World of Whisky. It currently receives 35,000 visitors each year. 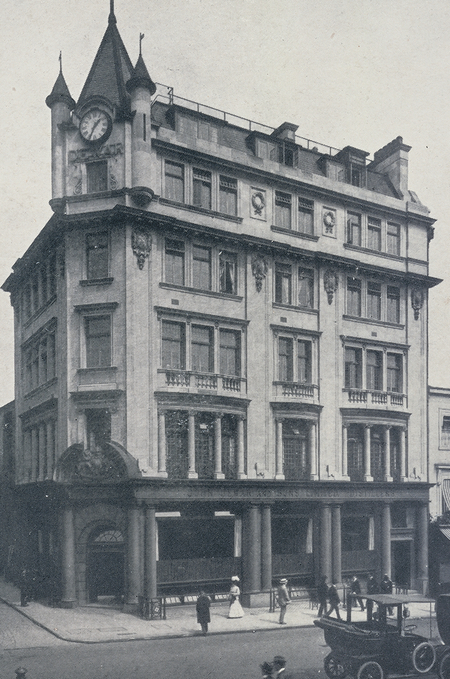 Bacardi also established new headquarters for Dewar’s on Glasgow’s London Road, where today huge tankers bring whisky for ageing, blending, marrying and bottling. Just down the road is the Camlachie Cooperage which repairs and remakes all the casks. As the millennium came and went it was decided that Dewar’s portfolio should be extended. 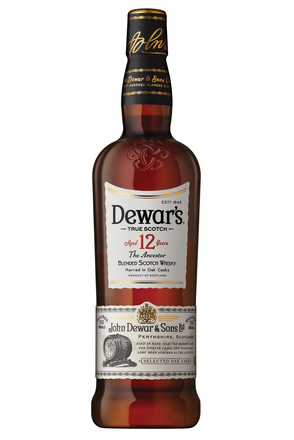 The Master Blender at the time, Tom Aitken, created a 12 year-old Dewar’s blend which utilised the company’s tradition of double-ageing, or marrying, in cask for a further six months after blending. This process had come from the original Master Blender, Alexander Cameron, when he developed a new method of marrying malt whiskies by region – adding these to grain whiskies only after they had matured together. 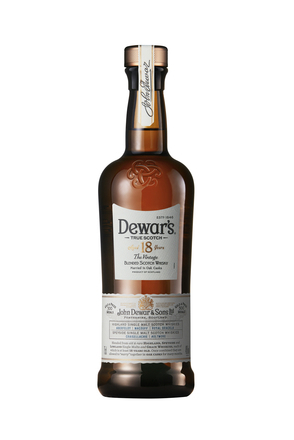 Tom Aitken then developed a Dewar’s 18-year-old blend and a premium Dewar’s Dewar’s Signature blend. 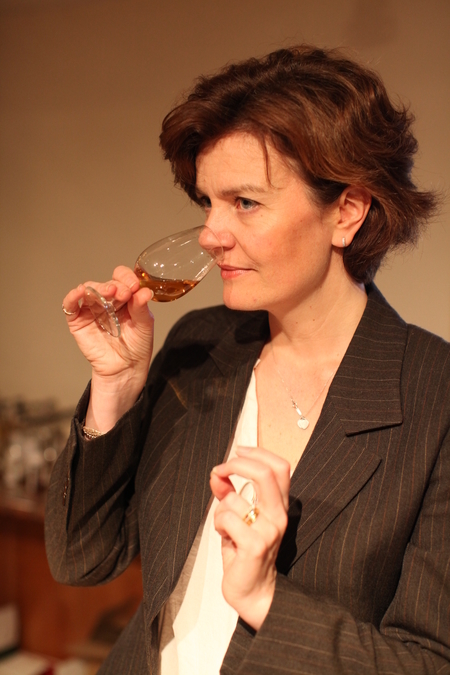 The current master blender, and the first female to hold the role in Dewar’s, Stephanie Macleod, has also created her own blend: a Dewar’s 15-year-old designed for the Chinese market. 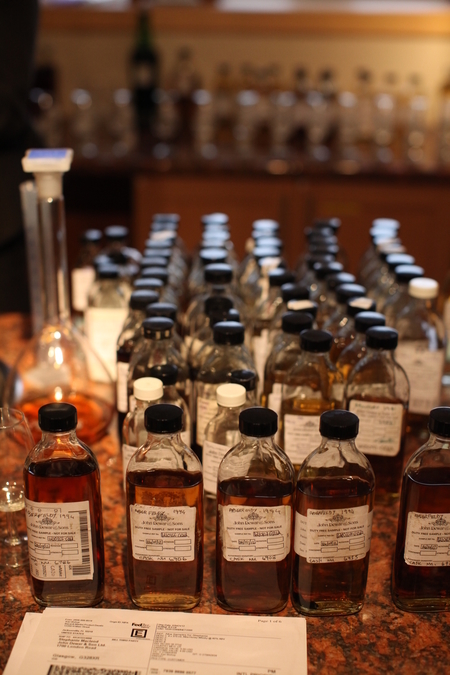 However, White Label remains the most widely consumed of the Dewar’s blends. Developed by Master Blender, Tom Aitken, this blended Scotch whisky is aged for 18 years and then married in a vat for an extended period prior to bottling. Released in 2010 and aimed at the Chinese market, this blend was designed to be mixed with green tea or diluted with water, as well as enjoyed neat. From Bacardi's whisky stable, the whiskies used in this blend are all at least 12 years old. 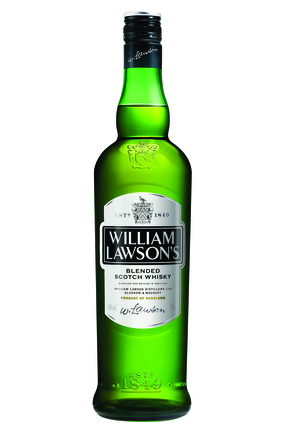 Now produced by Bacardi, this is William Lawson’s entry level blend.